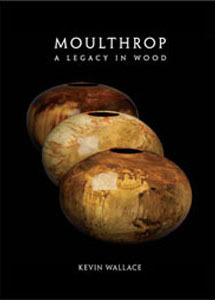 You may have heard the name Moulthrop in regards to wood turning, especially if you live near Atlanta. Even if you don’t live near Atlanta, you may have seen the name at the White House, the Smithsonian, the Museum of Modern Art, the Metropolitan Museum of Art, and the United States Department of State, as well as numerous other similarly prestigious institutions. I drove up to Marietta just northwest of Atlanta to visit the Marietta/Cobb Museum of Art to see “Moulthrop — A Southern Legacy”. I spent several hours there, and I came away with mixed feelings ranging from intense despair at my turning inadequacies to high ambition at the possibilities if I just keep pushing my craft. I took lots of pictures and have included a slide show (below) for you to see what I am talking about. What is difficult about simply seeing the photos is one cannot fully appreciate the scale of the objects. They are huge. In fact, the book I purchased at the front desk (Moulthrop, A Legacy in Wood, by Kevin Wallace) explains the methods and tools used by the three generations of turners. The Grandfather, Ed, started turning in the 1960’s when the craft was not widespread. He made his own tools and tried new methods and when he could not turn as large as he wanted, he simply built his own lathe. He laughs in the book about the heavy pieces of wood and the tools that resemble whaling harpoons, and actually getting flipped across the shop when the tool would catch in the wood. His Architect’s eye and natural talent served him well and soon people started to notice. One of my favorite pictures is of the grandson, Matt, at about 10 years old, standing inside a large scale chalice that Ed had made. After a while, his son Phillip took up the work, and then astoundingly, Matt, the third generation also picked it up. It is remarkable: three generations, all rising to the highest levels of their field, and all very accomplished to my eye. In fact, I like Matt’s work the best. To my thinking, it is cleaner and more delicate than that of his father or his grandfather. But then, you can decide for yourself. Look at the pictures I took, but the book yourself, and then keep an eye on their expedition schedule and check them out in person yourself if they make it to your neck of the woods. I’ve been turning a good while, but this stuff is amazing. Take a look at the slideshow below to see for yourself. On the Moulthrop website they have their upcoming exhibition schedule: http://www.moulthropstudios.com/schedule.html. It doesn’t list Richmond, but if you keep an eye on it, you might see something close-ish to you. It also looks like they have some pieces in the permanent collections of the Renwick Gallery of the Smithsonian and the US Dept of State “Art in Embassies” collection, if you are ever up in Washington. Hope you get a chance to see some in person! Stuck in Iowa its a big ?